A recent webinar on the Mediterranean diet, specifically on changing your protein – sparked a firestorm of discussion on beans and…gas. Eating more beans is a great way to get plant protein and decrease meat consu mption. They are inexpensive, versatile, add variety, and taste great. So why then are we not eating more beans – you guessed it – gas. No one wants to feel bloated after a meal. Thanks to indigestible carbohydrates found in beans, they do have a bloating – gas – filled reputation. Here are some ways to decrease the gas but keep the beans. Go slow – add beans slowly into your diet. Start with just a few tablespoons and build up. Soak well and rinse well. If you are using dried beans soak for 48 hours and drain and rinse well before cooking. Use fresh water for cooking, not the soaking liquid. If you are using canned beans, rinse well. Cook beans until very soft. Cooking well-done until very soft can help with decreasing gas production as well. Even canned beans can be cooked more prior to serving. 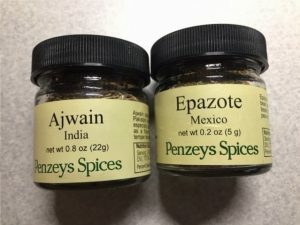 Add ajwain or epazote – both of these spices will decrease gas production – I swear by the epazote! Just add about a tablespoon to a large pot of beans during the cooking process. You can also add ginger or cumin as these spices help with digestion. Chew – eat slowly and chew well each bite.